Great teams are built on great communication. 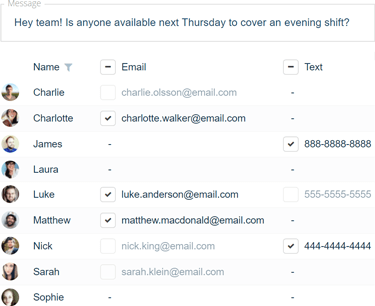 Give your team access to powerful messaging tools and intelligent automated shift reminders. Automated shift reminders mean your employees will always know when and where they are working. Reminders can be configured by employees to be sent during specific time windows and up to 30 days in advance. Active schedules can change often and it's important that everyone's kept up to date with relevant changes. 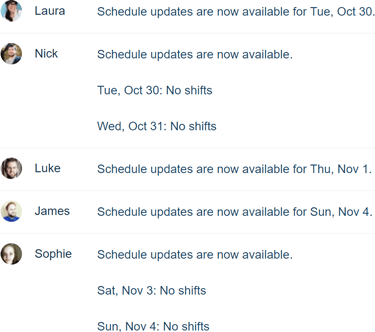 Findmyshift helps by sending notifications for schedule changes, cancellations, requests, and shift swaps. It is (and always will be) free to receive shift reminders, emails, push notifications and Slack messages. Never miss a chance to celebrate with automated upcoming birthday reminders. Send notifications and shift reminders to your employees directly through Slack. Planning your Christmas party? Your virtual noticeboard is the perfect place for group discussions with your employees. Bring the team together! Sending updates to groups of employees is easy with our batch "Send a message" feature. In just two clicks, you can broadcast emails, texts, and push notifications to all of your employees.